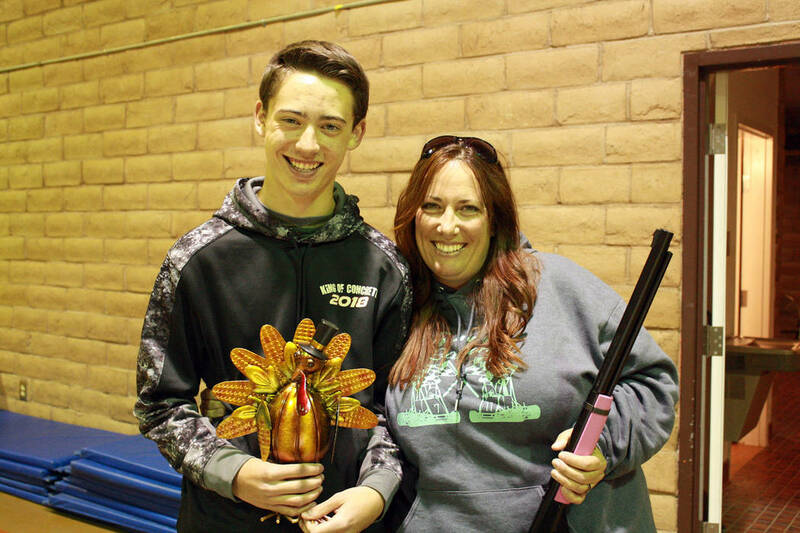 Boulder City Kim and Case Greene were winners of the adult and high school turkey shoot divisions in this year's competition. Youth flag football is played on Monday and Wednesday evenings at Veteran’s Memorial Pratte Field, 1650 Buchanan Blvd. through the first week of December. Flag football is sponsored by The Boulder City Community Club. There are four teams in the 3rd-5th grade coed division and four teams in the 6th-8th grade coed division. Youth sports is presently taking sign-ups for 3rd-7th grade basketball and kindergarten-2nd grade floor hockey which will both begin in January after the holiday break. The basketball clinic is slated for Saturday, December 8th from 9am-11am in the new gymnasium. The adult coed softball league will be competing in their end-of-the-year double elimination tournament on Dec. 2, beginning at 6 p.m. Boulder Dam Credit Union is currently in first place, and will be playing the fourth place Boulder Dam Brew Pub in the first round at Hemenway ballfields, 401 Ville Dr. T.Q. Pallets, the second place team, will be competing against the third place Lakefront Pools and Spas. Coed Softball is sponsored by Wahoos, and it will conclude on the early December date until the spring league begins in April. The adult men’s basketball league is having a manager’s meeting on Dec. 13 at 6 p.m. at the Parks and Recreation gymnasium, 900 Arizona St., to establish the league days and dates. All interested teams should have a representative present. This Dec. 15, the Parks and Recreation Department will host a dodgeball tournament at the old gymnasium beginning at 5 p.m. The entry fee is $60 and all of the entry fees will be donated to Emergency Aid of Boulder City for the holidays. The Sports Department will also host an adult kickball league in February for any teams that are interested in playing on Sunday evenings at Hemenway ballfields.